When it comes to fundamental physics, things can get spooky. At least that's what Albert Einstein said when describing the phenomenon of quantum entanglement—the linkage of particles in such a way that measurements performed on one particle seem to affect the other, even when separated by great distances. "Spooky action at a distance" is how Einstein described what he couldn't explain. According to Andrew Friedman, a research scientist at the University of California San Diego Center for Astrophysics and Space Sciences (CASS), "the race is on" around the globe to identify and experimentally close potential loopholes that could still allow alternative theories, distinct from quantum theory, to explain perplexing phenomena like quantum entanglement. Such loopholes could potentially allow future quantum encryption schemes to be hacked. So, Friedman and his fellow researchers conducted a "Cosmic Bell" test with polarization-entangled photons designed to further close the "freedom-of-choice" or "free will" loophole in tests of Bell's inequality, a famous theoretical result derived by physicist John S. Bell in the 1960s. 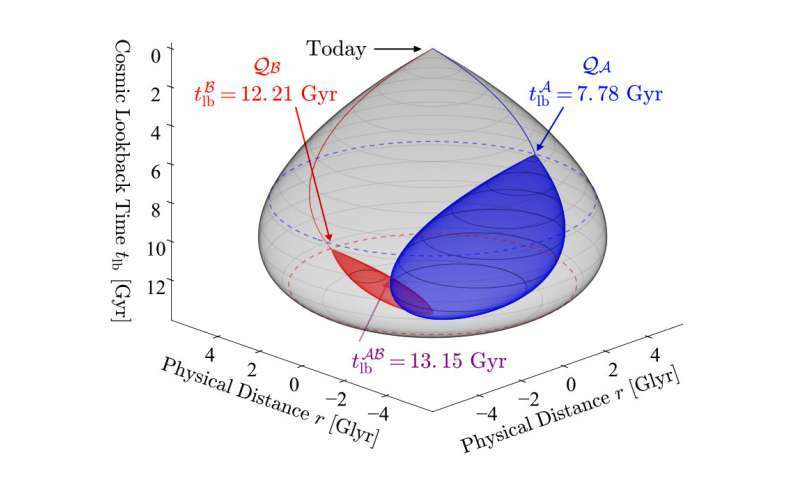 Published in the Aug. 20 issue of Physical Review Letters, their findings are consistent with quantum theory and push back to at least 7.8 billion years ago the most recent time by which any causal influences from alternative, non-quantum mechanisms could have exploited the freedom-of-choice loophole. "Our findings imply that any such mechanism is excluded from explaining the results from within a whopping 96% of the space-time volume in the causal past of our experiment, stretching all the way from the Big Bang until today," said Friedman. "While these alternatives to quantum theory have not been completely ruled out, we are pushing them into a progressively smaller corner of space and time." In their experiment, the researchers outsourced the choice of entangled photon measurements to the universe. They did this by using the color of light that has been traveling to Earth for billions of years from distant galaxies—quasars—as a "cosmic random number generator." "This is a rare experiment that comes along only very seldomly in a scientist's career: a pioneering experiment that sets the bar so high few, if any, competitors can ever match it," noted UC San Diego astrophysicist Brian Keating. "I'm so proud that my graduate student David Leon had the chance to make a significant contribution to this fascinating research, co-led by CASS research scientist, Dr. Andrew Friedman." Besides UC San Diego's Friedman and Leon, the full research team included lead author and Ph.D. student Dominik Rauch, along with Anton Zeilinger and his experimental quantum optics group from the University of Vienna; theoretical physicists David Kaiser and Alan Guth at MIT; Jason Gallicchio and his experimental physics group at Harvey Mudd College, and others. Expanding upon their previous quantum entanglement experiments, Friedman and colleagues went to great effort to choose entangled particle measurements using 3.6 and 4.2 meter telescopes in the Canary Islands, allowing them to collect sufficient light from the much fainter, distant quasars. "We pushed to the limit what could be done within the time constraints," said Friedman. "The experiment would not have been possible without an amazing international collaboration. It was a roller coaster experience to see it actually work."